With the advancement of CPU architecture, identifying the best options for memory within your server has become more challenging. 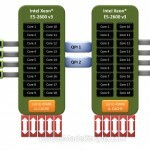 Should you use a single DIMM or does multiple DIMMs make a difference? 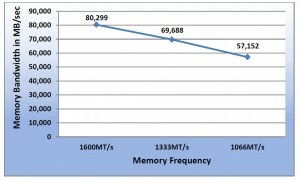 What about memory speed – does it really matter? Should you buy single rank (SR), dual rank (DR) or quad rank (QR) DIMMs. I’m not going to pretend to be a memory expert, but hopefully I will help answer these questions in today’s post. With current Intel CPU architecture, there are a few things to note: balancing memory is key for performance and you’ll want to have 2 CPUs to get full access to all memory. Although the latter may seem obvious, for environments with smaller workloads, two CPUs may not be needed. As you can see in the Intel CPU image below, 1/2 of the server memory is attached to each CPU, so in order to prevent yourself from being stuck with 12 DIMMs in a 2 socket server, populate the 2nd CPU. More importantly, though, is balancing the memory. Each CPU has 4 channels of memory, typically 3 DIMMs deep, allow up to 12 DIMMs per CPU. Although populating a single DIMM per CPU is accepted, you will not get the best performance, and here’s why. Picture a highway with a toll booth. There are 4 lanes but only one lane is open. While the cars will have no trouble getting through the single toll booth, they can’t get through as quickly as they could if all 4 toll booths were open. This is the same with using a single DIMM. Let’s say your application needs 32GB of RAM. If you put a 16GB DIMM on each CPU, you won’t have as good as performance as 4 x 4GB DIMMs per CPU. In a nutshell, I always encourage populating in groups of 8 (4 per CPU) in order to maximize the memory channel’s performance. Does Memory Speed Really Matter? The short answer is – yes, if you need performance. 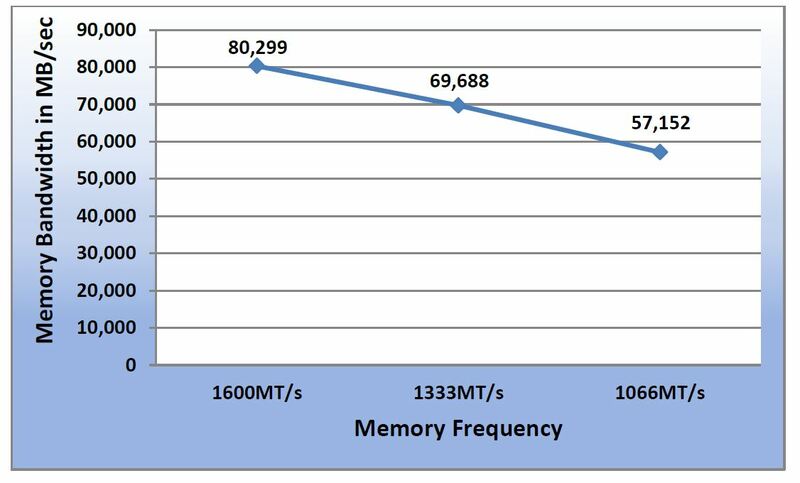 In a white paper written by John Beckett from the Dell Solutions Performance Analysis team, different memory speeds were compared which showed a substantial 13% decrease in performance in 1333MT/s vs 1600MT/s. The catch, though, is that Intel has 3 different “bins” of CPUs, so in order to get the top memory frequency, you’re going to have to use a CPU in the “Advanced” bin category. 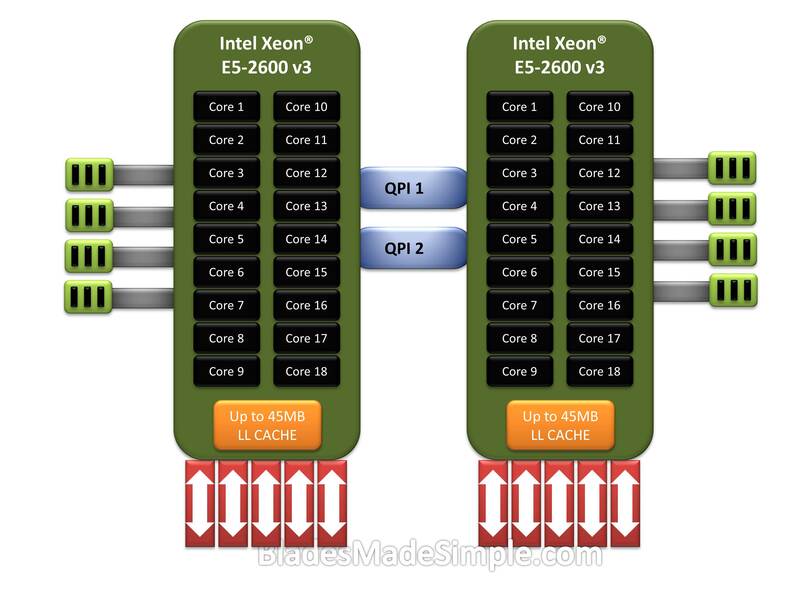 An additional FYI is that the Intel Xeon E5-2600 v3 now goes up to 2133Mhz in both 1 DIMM per channel and 2 DIMM per channel but drops down to 1866MHz at 3 DIMMs per channel – so if you want the best performance, buy a top bin CPU and keep the memory qty to 16 DIMMs or below. For more information on populating DIMMs, as mentioned in the previous section, check out that white paper I referenced above. What About Memory Ranks – What is Better? This is one question I’ll ask for your opinion on. From what I’ve researched, it appears that Dual Rank (DR) DIMMs are preferred for performance compared to Single Rank (SR) DIMMs or Quad Rank (QR) DIMMs. I know that QR DIMMs have memory chips stacked, so it runs at slower frequencies, however I’m not sure I get why DR DIMMs perform better. I welcome any feedback you have on this one. I’m interested in your thoughts or comments around memory configurations or best practices. Please post your comments below.